Oral Roberts to the Rescue? 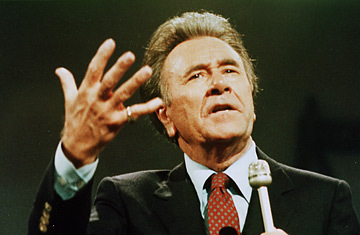 In 1987, television preacher Oral Roberts made a dramatic appeal. If his supporters did not send donations totaling $8 million dollars within three months, he warned that God would "call me home." There were those who complained that Roberts was extorting his viewers and using the Deity as an accomplice, but there was no doubting his charisma  or his results. Roberts received over $9 million, and God did not call him home. Now, at age 89, the Tulsa, Okla., university that bears his name has called Roberts home from a California retirement  under the most excruciating of circumstances. On Wednesday, the head regent at Oral Roberts University announced that the school is an astonishing $52.5 million in debt. This news arrived just three weeks after the revelation of a wrongful termination suit filed against the school by three former professors who claim that they were fired after providing the school's Board of Regents with a report detailing moral and ethical lapses by Oral's son Richard, who had inherited the school's presidency from his father, and Richard's wife Lindsay. Among the allegations: the Roberts had remodeled their home eleven times in 14 years with university money; they bankrolled one of their daughters' $29,411 trip to the Bahamas with school funds; and Lindsay Roberts had spent the night in an O.R.U. guest-house with an underage male nine times. Early in October Richard Roberts, 59, told students the suit amounted to "intimidation, blackmail and extortion," and appeared with his wife on Larry King Live to deny the allegations. Nevertheless, on October 17 Richard took a leave of absence from the university presidency and Oral Roberts returned to the campus chapel last Monday to announce, "The devil is not going to steal O.R.U." He received a standing ovation and was renamed O.R.U. 's co-president, but George Pearsons, chairman of the school's Board of Regents, seems intent on limiting his influence. "He is the founder. He is a great icon," Pearsons told The Daily Oklahoman. "But the bottom line is, any decision is going to come down to the board." The school has hired a Washington, D.C., law firm to run an independent investigation and an audit. It suggested that the professors' case could be solved by mediation, but the ex-teachers' lawyer has so far refused to engage. The whole affair is a sad denouement for one of the pioneers of televangelism, a man who, in the early 1980s, seemed poised to pull the then-declasse Pentecostal and Charismatic traditions, which emphasize gifts of the Holy Spirit such as healing and speaking in tongues, into the mainstream. Says Randall Balmer, chair of the religion department at Barnard College, who has written about Roberts, "I feel badly for him. This must be a blow." What happened? J. Lee Grady, the editor of the magazine Charisma, wrote recently, "I don't know about you, but I'm having flashbacks of 1987," the year that the sexploits of Jimmy Swaggart and financial hijinks of Jim Bakker gave televangelism its reputation for sleaze. But while the allegations in the suit certainly meet Swaggart-quality standards of salaciousness, the causes of the university's fall may owe more to mismanagement than greed or negligence, suggests John Schmalzbauer, an expert in Christian higher education at Missouri State University. Unless some party siphoned off "massive multimillion-dollar diversion of funds over 25 years," he says, "I think the causes must be deeper and more structural." The school had a history of ambitious ventures that verged on recklessness. Roberts decided to make it an athletic force, and as recently as last year its basketball team advanced to the NCAA March Madness. But its big-ticket failures may in the end have been more telling. For years it offered a law program, but eventually ended up selling it to Pat Robertson. The amount of the possible losses involved are not immediately available, but documentation exists of an even bigger money pit, the City of Faith Medical Center, a combination physical and spiritual healing facility. City of Faith represented a fascinating attempt to pull charismatic faith healing into a context that would be accepted by the general public. But In 1987, TIME reported that the medical center, which cost $250 million to build, was draining Roberts of $30 million to $40 million a year. In his 1995 autobiography, Expect a Miracle: My Life and Ministry, Roberts revealed that he had undertaken his unorthodox $8 million "Call me home" fund drive because God had told him to keep the Center afloat or be prepared to perish. There is some irony in the fact that this last-ditch effort to float his bid for mainstream credibility provided the very ammunition used by his critics to relegate him permanently to the Christian fringe. Despite the cash infusion, City of Faith closed in 1989. If it continued to bleed money in its last two years at the same rate it had been, then it could conceivably account for the entire current debt, or the beginning of a negative spiral. Alternatively, it could simply be indicative of a faith-based accounting style that much of Evangelicalism left behind long ago, with the founding in the 1970s of the Evangelical Council for Financial Accountability, a 2000-member self-policing group that stresses not just fiscal honesty but efficient accounting practices. Like many Pentecostal and charismatic institutions, O.R.U. is not a member. Of course, a religious university doesn't have to be charismatic to have money problems. Liberty University, Jerry Falwell's academy in Lynchburg, Va., was between $20 million and $25 million in debt until this year. But when God called Jerry Falwell home last May, it turned out that he had a $34 million insurance policy. It was used to bail out his school.